Rodney M. Davis was born April 7, 1942, in Macon, Georgia. He attended elementary school and high school there and graduated from Peter G. Appling High School, May 29, 1961. Shortly after graduation, he enlisted in the United States Marine Corps in his hometown, August 31, 1961; then reported for recruit training with the First Recruit Training Battalion Marine Corps Recruit Depot, Parris Island, South Carolina. Upon completion of recruit training in December 1961, he was transferred to the Marine Corps Base, Camp Lejeune, North Carolina, and under-went Individual Combat Training with the Second Battalion, First Infantry Training Regiment, graduating the following February. He then joined Company "K", Third Battalion, Second Marines, Second Marine Division, FMF, at Camp Lejeune and served as a rifleman until May 1964. While stationed at Camp Lejeune, he was promoted to Private First Class, April 1, 1962, and to Lance Corporal, January 1, 1964. Lance Corporal Davis was ordered to London, England, for a three year tour of duty as Guard with the United States Marine Detachment, Naval Activities. He was promoted to Corporal, January 1, 1966, and to Sergeant, December 1, 1966. Ordered to the Republic of Vietnam in August 1967, he was assigned duty as a Platoon Guide with Company "B", First Battalion, Fifth Marines, First Marine Division. He was operating with his unit in the Quang Nam Province on a search and clear mission during Operation SWIFT, when they were attacked by a large North Vietnamese force. Elements of the platoon were pinned down in a trench line by mortars, heavy automatic and small arms fire. He went from man to man encouraging them on and also returning fire at the same time. An enemy hand grenade fell in the trenches his men were fighting from and without hesitation he threw himself upon the grenade. He saved his fellow Marines in this selfless act and thus earned the nation's highest military decoration . . . the Medal of Honor. His medals and decorations include: the Purple Heart; the Good Conduct Medal; the National Defense Service Medal; the Armed Forces Expeditionary Medal; the Vietnam Service Medal; the Military Merit Medal; the Gallantry Cross with Palm; and the Republic of Vietnam Campaign Medal. USS Rodney M. Davis (FFG-60), an Oliver Hazard Perry-class frigate, is a ship of the United States Navy named for Marine Sergeant Rodney M. Davis (1942–1967), who was posthumously awarded the Medal of Honor for his heroism in the Vietnam War. 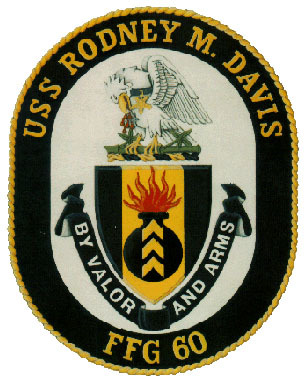 Rodney M. Davis was laid down on 28 October 1982 by the Todd Pacific Shipyards Co., Los Angeles Division, San Pedro, Ca. ; launched on 11 January 1986; and commissioned on 9 May 1987. 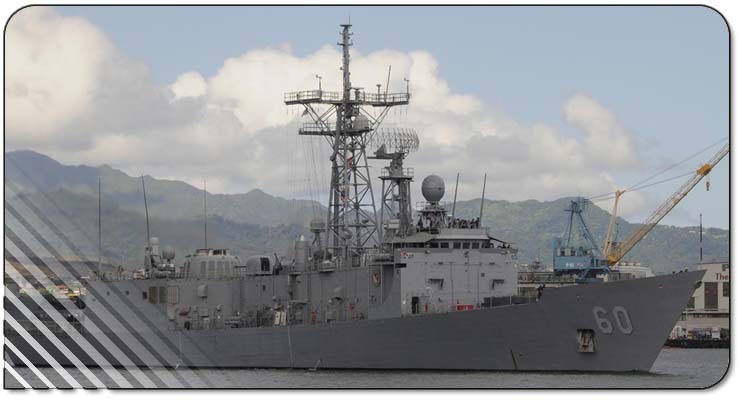 The ship was homeported at Yokosuka, Japan for several years while assigned to Destroyer Squadron 15. As of 2005, Rodney M. Davis is home ported at NS Everett, Washington, and assigned to Destroyer Squadron 9. On 28 April 2001 a LEDET assigned to the Rodney M. Davis, with later assistance from the US Coast Guard Cutter Active (based in Port Angeles, WA) made the largest cocaine seizure in maritime history when they boarded and seized the Belizean F/V Svesda Maru 1,500 miles south of San Diego. The fishing vessel was carrying 26,931 pounds of cocaine. In the summer of 2005, Davis participated in the 11th annual Cooperation Afloat Readiness and Training (CARAT) exercise. CARAT is an annual series of bilateral military training exercises designed to enhance cooperative working partnerships with several Southeast Asian nations. Ensuring freedom of the seas by increasing maritime security efforts in the region is a primary focus of the CARAT series. In the summer of 2006, with the help of the crew from the Rodney M. Davis, 11 tons of creosote logs were removed from the beaches of NAVMAG Indian Island. The project was completed with no labor cost, due to the support of the Davis crew on this shoreline enhancement project. Removal of creosote contaminant source from the beaches enhances shoreline habitat and marine water quality. Davis departed Naval Station (NAVSTA) Everett for a deployment to the Southern Pacific Nov. 28, 2006. On March 3, 2007, Sailors from Davis participated in two community relations (COMREL) projects during the ship’s visit to Panama in February. The Davis Sailors' COMREL efforts included visits to local orphanages and maintenance/improvements at a library in the Cinco de Mayo district of the city. Sailors spent their day cleaning, repairing, and painting chairs and cabinets at the Eusebio Morales Library. Five more Davis sailors visited a local orphanage, Hogar Divino Nino, to spend time with infants and toddler orphans to give them some much needed human contact. The Davis sailors took diapers, formula, baby wipes and other child care supplies to aid the staff at the orphanage. The two groups reassembled at another orphanage, Nutre Hogar, to hand out Spanish-language Disney movies to the children, which were part of a generous donation made through the Jacksonville, Fla., area office of the United Service Organizations (USO). Davis completed her transit of the Panama Canal on March 25, 2007 from the Caribbean Sea to the Pacific Ocean. The Sailors of Davis completed their third community relations (COMEL) project in Panama City, Panama on April 3, 2007. During the ship’s three-day port visit, 21 members of the crew spent a day helping to improve Hogar Nuevo Pacto, a home for abused children in Panama City. The crew raised $1,100 in donations to pay for supplies and improvements for the home. Davis sailors bought equipment to repaint the inside of the house, as well as groceries, new shower curtains, bed sheets, and light fixtures for the children’s living areas. The home, previously U.S. military housing, was greatly in need of some modernization and assistance from able hands. Despite rainy weather outside, the crew spent the day productively inside, painting hallways and bedrooms, installing conveniences like toilet paper dispensers and toothbrush holders in the bathrooms, and replacing lights and correcting electrical safety problems. On the evening of April 19, 2007, Davis intercepted the fishing vessel Mariana de Jesus in international waters. The 33-foot vessel was overcrowded with 31 migrants. Davis gave the migrants food and water and they were all examined by the ship's medical personnel. Some were treated for mild dehydration and headaches, but overall they were found to be in good physical condition. The migrants were then transferred to the El Salvadorian Navy. On April 23, 2007, the Costa Rican Coast Guard vessel Juan Rafael Mora (JRM) and Davis intercepted the fishing vessel Kuerubin with 61 Chinese migrants, all of whom were transferred to the JRM. Davis was tasked to ensure their health and safety was maintained by providing food, water, and medical supplies. All were malnourished and dehydrated for they had been without food or water for four days. The frigate returned to Everett naval base on June 12, 2007 after a six-month deployment in the war on drugs. The first maritime seizure of liquid cocaine occurred April 25 when the Davis located the fishing vessel Emperador from Ecuador in the Eastern Pacific. A Coast Guard law enforcement team boarded the Emperador and located 3,850 gallons of liquid cocaine. Each gallon of the liquid is the equivalent of 1.3 kilograms of processed cocaine. The Coast Guard boarding team detained the 17 crewmembers of the vessel. Sixteen of the crewmembers were from Ecuador, and one of the crewmembers was Colombian. The Coast Guard boarding team and crew of the Davis transported the vessel to Guayaquil, Ecuador , for further examination by officials from the Drug Enforcement Administration and Ecuadorian authorities. The majority of the liquid cocaine, 3,600 gallons, was turned over to Ecuadorian authorities for destruction. Seal:The complete coat of arms as described above, on a white field enclosed by a dark blue border edged on the outside with a continuous gold rope and inscribed in gold with the words USS RODNEY M. DAVIS at the top and FFG 60 below. The Shield: Dark blue and gold are the colors traditionally associated with the Navy. The heraldic grenade represents the enemy grenade upon which Sergeant Rodney Maxwell Davis (USMC) threw himself when it landed in the midst of his platoon in Quang Nam Province, Republic of Vietnam, on 6 September 1967. The grenade, with chevrons representing sergeant's stripes, placed on a pale suggesting containment, further symbolizes his brave action which saved the lives of many of his fellow Marines and enabled the platoon to hold its ground. The Crest: The heraldic pelican, believed in antiquity to wound her breast with her long curved bill in order to draw blood for the purpose of feeding her young, is symbolic of Sergeant Davis' selfless act by which he gave his life to save others. The light blue collar with a suspended gold inverted star alludes to the Medal of Honor awarded to him for his heroic act. The sprig of bamboo signifies South Vietnam where Sergeant Davis fought and died. Motto: On a scroll azure doubled argent the words "BY VALOR AND ARMS" in letters of the like.